Legal case against mountaintop removal mining: Big coal finally pays for some of its environmental impact. The first crack in a firewall that has protected big coal for decades. Mountaintop-removal and valley-fill coal mining at Massey Energy’s Edwight site in Sundial, W.Va., on April 16, 2009. Since the 1990s, small bands of Appalachian residents, regional environmental groups, and more recently the EPA have fought what often seemed like a futile battle against mountaintop-removal mining, the radical practice of blowing the tops off mountains to get at the coal seams underneath. The coal companies, backed by local political establishments and conservative jurists skeptical of possible regulatory overreach, have fended off multiple attempts to shut down mountaintop operations. As a result, an ever-widening swath of Appalachian peaks and valleys has been obliterated: approximately 2,200 square miles, according to the EPA, in what is likely a conservative estimate because the footprint often extends beyond the permit zones. That’s an area almost the size of Delaware. That expanse kept growing as the battles mostly went in coal’s favor. Until this month, that is, when environmental groups won a decisive legal victory over a coal company. It may prove to be turning point in the war over the mountaintops, and for the future of coal. True, a specific chain of misfortunes brought Patriot to the table. It’s looking to exit from bankruptcy, the result of falling coal prices, bad business decisions, and huge pension obligations. It was in this context that Appalachian environmental groups forced their issue. Patriot was also on the hook for hundreds of millions of dollars to clean up discharges of the mining pollutant selenium from its operations. Pulling the plug on mountaintop removal was part of the cleanup settlement. Other companies aren’t planning to follow suit: “No, the decision and agreement is theirs and it does not affect our mining plans,” a spokesman for Alpha Natural Resources, the leading surface mining company in West Virginia, told the Charleston Gazette. But Patriot’s woes aren’t unique. They grew out of endemic problems with mountaintop removal that have been getting worse, putting mounting legal, regulatory and economic pressure on the companies that do it. Appalachian forests are an ancient and unique ecosystem, one of the oldest in the world, with some of the highest levels of biodiversity to be found in a temperate zone. Destroying them is almost by definition ecological disaster. But because mountaintop removal in Appalachia is a relatively new phenomenon, it’s only in the past few years that scientists have begun to fully document not just the extent, but the nature of the damage. 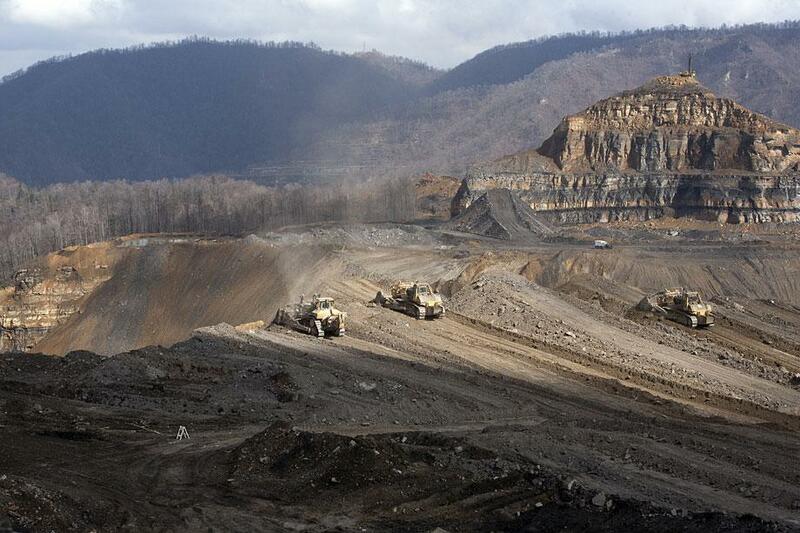 Mountaintop removal is a three-step process. In the first, peaks are dismantled, descending layer by layer, using explosives and draglines, and the coal harvested. I’ve been to Patriot’s Hobet mine in Boone County, W.Va. Its sprawling operation—the largest single mountaintop-removal mine, covering more than 25 square miles—evokes the smoky, cratered, lifeless aftermath of a World War I battlefield. In the second phase, the vast piles of rock and soil debris this creates—larger in volume than mountaintops themselves, because of the extra space between all those boulders—are dumped in neighboring valleys, creating so-called “valley fills.” Finally, the lopped-off mountaintop is usually bulldozed and planted with something green, creating artificial meadows where none existed before. The worst problem isn’t actually the missing peaks. Forests can be replanted, and sometimes the more virtuous companies actually do this. It’s what the mines do to the delicate mountain waterways. Dumping a mountaintop’s worth of rock into a valley doesn’t just obliterate all life there. It stops up headwater streams, literally the wellspring for the forest ecosystem and the point of origin for entire watersheds. So far more than 1,200 miles of stream beds have been buried. These cannot be restored. And rainwater that once would have fed those nascent brooks passes through a filter of mashed-up mountain instead. It’s these downstream impacts that came back to haunt Patriot. Selenium is a micronutrient that bioaccumulates up the food chain and has been linked to a variety of problems, including deformed fish. Selenium contamination downstream from Hobet and other Patriot mines is chronically high. Patriot had thus violated the terms of the Clean Water Act it promised in its permits to observe. Environmental groups took to the courts to get those terms enforced. Cleaning up selenium contamination is complex and expensive; when Patriot agreed to a major cleanup last January, it took on a crushing obligation estimated at $400 million. Mountaintop removal’s impacts on human health are fuzzier, but here too new findings are painting an alarming picture. Since 2009, Michael Hendryx, a professor of public health at West Virginia University, has produced a series of peer-reviewed studies with various colleagues that show an association between proximity to surface mines and various health problems: cardiovascular illness, cancers, and birth defects. Hendryx has begun investigating whether there is a causal connection for any of these. Finding a systematic link between local environmental contamination and such a wide range of health problems would be quite unusual. But in a study published in September, he and several colleagues collected particulate matter from around a mountaintop site in southern West Virginia, consisting mostly of sulfur and silica: that is, dust from the rocks pulverized by demolition explosions and other mining activities. They exposed rats to it, and their lung tissue showed telltale signs of stress that’s a common precursor to cardiovascular problems. Next up, Hendryx says he is planning to collect more samples from air, water, and soil around mountaintop sites. As with the environmental evidence, such public health findings are likely to cause more legal and regulatory problems for coal companies. Of course, the companies have been aggressive, and mostly successful, at defending their interests in the courts. After years of indifference to the issues under Bush, the Obama EPA has tried to assert more authority over mountaintop permits. The EPA is supposed to enforce the Clean Water Act, and the more aggressive posture is part of the “War on Coal” that energy companies furiously denounce. But the agency’s efforts have so far been rebuffed by the courts as an overreach: Under the weird legal regime that governs mining, it’s the Army Corps of Engineers, not the EPA, that has the ultimate say-so over those permits. This is why the Patriot settlement is a breakthrough: It is a crack in the legal firewall that has protected mountaintop removal for 20 years. If more selenium suits follow, it may crack further. Long-term, such big cleanup costs could be a big drag on surface mining, which is already facing serious economic headwinds. The Appalachians have been actively mined for more than a century, a longer time than any other region of the United States. The easy-to-get stuff is long gone. Mountaintop removal is a product of this trend. Blowing the tops off mountains offers an economies-of-scale approach to coal mining: bigger mines, fewer employees, lower operating costs per unit. Until recently, aggressively expanding the practice helped make up for plunging productivity. (In central Appalachia, coal mine productivity fell 45 percent, an average of 5.9 percent per year, between 2000 and 2010.) But overall production has continued to fall. Add to that increasing competition from natural gas. Over the past year, low gas prices have driven down the domestic price of coal, and the Appalachian coal industry has been particularly hard-hit. Some producers are shifting their focus to metallurgical coal, a higher-quality form that is mined underground, rather than the thinner seams exposed by mountaintop mines. Someday, some combination of economic forces and regulatory control will make mountaintop removal untenable. Even when that happens, though, there’s no way to rebuild a mountaintop or unfill a valley. Which means those blots on the landscape, and the environment, will linger for decades—or centuries.